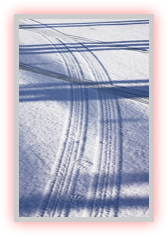 Be prepared – is your vehicle ready for winter? There are things you can do at the start of win­ter, before the bad weather, to pre­pare your vehi­cle and reduce the chances of break­ing down. Check your vehi­cle is in good run­ning order, make sure tyres have got plenty of tread and con­sider reg­u­lar ser­vic­ing to help min­imise the risk. If you’re going away, check what the fore­cast says for your return jour­ney and if you’re trav­el­ling some dis­tance remem­ber to check the weather at your des­ti­na­tion and along the route too. Gather together the fol­low­ing items and pack in your vehi­cle at the start of the win­ter sea­son, you never know when you might need them! Be prepared - Is Your Vehicle Ready? •	PETROL (or diesel)...Have you got enough? Do you know where to fill up? •	DAMAGE...check wipers, lights etc for signs of wear and tear or dam­age, check wind­screens, win­dows and lights are clear of ice and snow. •	RUBBER TYRES ...are they well inflated, legal, with good tread and free from damage? •	YOU...are you fit to drive? Have you slept well? Are you tak­ing any med­ica­tion that could make it unsafe for you to drive? If you are plan­ning to travel with pets, ensure that ani­mals are safe and secure, and will not be a dis­trac­tion to the dri­ver or peo­ple trav­el­ling in your vehi­cle — seek appro­pri­ate advice before you travel.